In teaching, the role of technology is currently transforming and is becoming one of the most important influential factors. The role has been widely discussed in some current educational policy studies (Charbonneau-Gowdy, 2018; Nortvig, Petersen and Balle, 2018). If technology had been properly integrated in instructional activities, it would have led to great expectation in the improvement of teaching and learning, and shaping opportunities for future workforce (Mishra and Koehler, 2006). Through the history of technology integration, technology illiteracy is now considered as the new form of illiteracy (Rosen and Michelle, 1995). This fact has lead policy makers in every country in the world to gain a new strong intention and effort to equip schools and universities with Information and Communicating Technology (ICT) infrastructures such as computers and internet access as well as providing qualified staff, teachers and administrators to produce quality students as the next generation who are proficient in technology use for every opportunity in the future. There is no dispute that computers and internet use have been able to aid the teaching and learning process as well as to provide proper opportunities to facilitate students’ learning. Many studies have underlined positive integration effects of technology in instructional processes (e.g. Ertmer and OttenbreitLeftwich, 2010; Deng, et al., 2014; Kimmons, et al., 2015). In addition to the positive effects of integration, breaking down barrier should also be considered and any strategy that seeks to change teaching practice should consider the social and cultural context of the school organization (Hargreaves, et al., 2001; Tondeur, et al., 2009). One common issue when implementing new strategies with ICT is that the stakeholders tend to focus on adopting the technology, without providing the appropriate conditions for the social and cultural learning that is required for such an innovation (Hargreaves, et al., 2001). Among these circumstances, all school members who are involved should adopt a common approach, including school administrators or principals. This common approach includes their perception towards barriers of ICT integration in an educational setting (Alghamdi and Prestridge, 2015). For school administrators, the logical approach is one of the most vital things regarding barriers of ICT integration in schools. The principals are very important in creating the conditions required for a school reform to be finally beneficial for ICT integration (Hargreaves, et al., 2001; Korumaz, 2016). Studies have revealed that principals who have capacities in supporting and guiding their school teachers in technology integration in teaching practice obtain a clear vision of how the technology will contribute to improving projects in shaping the ways students learn in current technological development in education (Chang, 2012; Korumaz, 2016). The school principals’ involvement in the integration of technology is crucial for the programme’s sustainability. Fewer studies were conducted to investigate school principals’ perception towards ICT integration more especially in developing countries (Tondeur, et al., 2009). 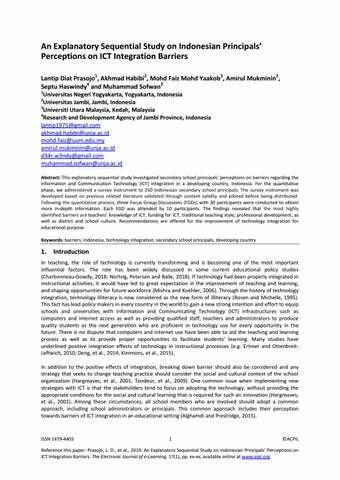 Therefore, this current study was conducted to comprehensively understand barriers experienced by secondary school principals regarding technology integration in education in Indonesia as one of the developing countries. The two guiding questions are: 1. 2. What and how are ICT integration external barriers perceived by Indonesian secondary school principals? What and how are ICT integration internal barriers perceived by Indonesian secondary school principals? 2.1 Barriers of ICT integration Challenges towards ICT integration have been inspiring educational researchers to cover and overcome the barriers to produce successful ICT integration into teaching (Ertmer, 1999). Barriers to ICT integration was defined as conditions which provide difficulties to the successful process of ICT integration in educational setting (Ertmer, 1999; Bingimlas, 2009; Koh, et al., 2013; Tsai & Chai, 2012). Researchers have discussed barriers in ICT integration in various ways, conditions and settings however, two underlined classifications consistently were categorized and these are external barriers (resources and institutions) and internal barriers (teachers and their attitudes). In early studies, Ertmer (1999) described these barriers with terms of first-order and second-order to ICT integration. She discussed first- and second-order barriers as a comparison to evaluate teachers’ integration of ICT in an elementary school (Ertmer, 1999). While researchers such as (Bingimlas, 2009; Koh et al., 2013) hypothesized that the barriers interact in various ways however, there has been no evidence to show which barriers are the most influential in ICT integration into instruction. 2.2 External barriers of ICT integration Studies have revealed that the external or original first-order barrier of ICT integration, having access to computers and the internet, has been lifted in almost every public school classroom in developed countries (Gray, Thomas and Lewis, 2010). However, in developing countries such as Indonesia, the barrier regarding computer and internet facility is still prevalent (Habibi, et al., 2018). In addition, some teachers state that limited access to computers and internet is still a main barrier to full integration of ICT (Cuban and Jandric, 2015). Other external barriers are inferior hardware or software, limited peer, and technical support, lack of training and a lack of time to improve skills to use computers and the Internet (Ertmer, Ottenbreit-Leftwich and York, 2007; Kim, et al., 2013; Kilinc, Tarman and Aydin, 2018). Researchers in educational technology have revealed that these barriers will probably always emerge with the changing of technology including innovation and development as well as the current design of the school system (Hermans, et al., 2008). Reducing firstorder barriers or external barriers requires costly funding and the reforming of pre-service teacher training models at university level (Ertmer, et al., 2012; Lim, et al., 2013; Machado and Chung, 2015). 2.3 Internal barriers In addition to external barriers, researchers have found that second-order barriers or internal barriers are more difficult to overcome (Alkhawaldeh and Menchaca, 2014; Collins and Halverson, 2009; Cui and Vowell, 2013; Ertmer, et al., 2012). For example, teachers as practitioners in the teaching and learning process were found to have many external or first-order barriers, as well as personal or second-order barriers (Alkhawaldeh and Menchaca, 2014; Ertmer, et al., 2012). Even those who have had positive attitudes towards ICT integration would eventually develop negative attitudes towards ICT integration because of the first-order barriers they found (Collins and Halverson, 2009). The most common second-order barriers include pedagogical beliefs, motivation, established practices and cultures and personal beliefs about computers (Ertmer, et al., 2012; Mueller, et al., 2008). Lantip Diat Prasojo et al. This study was a sequential explanatory design characterized by the collection and analysis of quantitative data in the first phase of the research, followed by the collection and analysis of qualitative data in the second phase (Brannen, 2005; Creswell 2014). A sequential explanatory strategy was used because this study sought to use quantitative research. To obtain further information about the results, the phase was followed by qualitative research (Brannen, 2005). This approach emphasized how the qualitative findings helped elaborate or extend the quantitative results (Creswell, 2014). This study was financially supported by the Indonesian Ministry of Higher Education, Technology and Research which took almost a whole year to complete. The authors are from three universities of two countries and one research institution, Universitas Negeri Yogyakarta, Jambi University, and Jambi Agency of Research and Development (Indonesia) and Universiti Utara Malaysia (Malaysia). 3.1 Quantitative phase We used survey design which provides numeric description using questionnaires for data collection. Survey research aimed to describe the situation and the characteristics of a population (Fraenkel & Wallen, 2009). The population of this study was more than 1000 secondary school principals in one Indonesia. Using random sampling, we distributed the survey instrument to 250 principals; however, only 210 principals returned the survey. Two hundred and one surveys were completed and assessed. The first step in developing the barriers survey was to review relevant methods literatures instruments (Avidov-Ungar and Shamir-Inbal, 2017; Claro, et al., 2017; Kilinc, Tarman and Aydin, 2018; Serhan, 2007) that were already being used for assessing barriers of technology integration in educational settings. Most of these instruments focused on the way in which internal and external barriers were constructed regarding technology integration. All authors contributed in developing and revising every item in three sessions of discussion. Following the discussion, the instrument was sent to a panel of experts; three experts in educational technology and two experts with degrees in educational policy and management as part of a content validity process (Lawshe, 1975). Each expert was requested to rate the extent to which each question measured using a 10-point scale (with 1 being the least measure and 10 being the greatest measure). The experts were also asked to provide some comments and suggestions for each question and, in some cases, suggested their own possible question list for either internal or external constancy. After being reviewed by the panel of experts, 32 items were set. However, six items were eliminated because they were not reliable after being piloted with 35 principals. The remaining 26 items were measured with a four-level likert scale: 1. Strongly disagree, 2. Disagree, 3. Agree, and 4. Strongly agree. In addition to the main instruments, demographic information namely gender, age, and experience, as well as educational qualification were also distributed. We collected the data through a printed questionnaire. After obtaining the data, we measured the consistency reliability or coefficient alpha (.79 for internal barriers and .86 for external barriers). According to George and Mallery (2001), the alpha is considered to be acceptable. We used descriptive statistics (Ross, 2010) measuring the mean and standard deviation of the research for the data elaboration. contacted by phone calls and short messages and asked to come to the FGD sessions. All costs including transportation, accommodation, and consumption were paid by the authors using the research funding. The FGDs were divided into three sessions; each FGD was attended by 10 participants. Discussions lasting about 120 minutes were recorded and video-taped. The survey instrument provided the set of guiding questions for the semi-structured discussion or interview. Semi-structured questions were applied to understand how some interventions work and how they can be improved. This allows interviewers to discuss issues that may not be considered (Creswell, 2014). During the FGDs, the participants were free to argue but limited to certain rules introduced at the beginning of the discussion. We used Google docs Voice Typing to transcribe the recording, an online application for data transcription that needs clear sound in the process. We analyzed the data using within-case and cross-case analysis that consists of thematic conceptual-ordered analysis, causal network analysis, and partially ordered analysis (Stake, 1995). We processed the data analysis with equal methods although the participants' background and experience varied. The first activity that the researchers did after obtaining the data from focus group discussion was to transcribe the data. Using the latest invention from Google, the data was processed through Google docs voice typing. The next step was to compile this transcription. After compiling the data, we printed the files in order to examine the data. We read and re-read the transcripts to highlight and examine any connections and omissions. This activity was lead by one of the researchers. The coding was manually done followed by the translation process which resulted in themes and sub-themes. In relation to the research aim, we focused on the topic in accordance with the survey results; to discover any emerging information in line with the barriers of ICT integration from the principals’ perspectives. To ensure the trustworthiness of the study, we included verbatim examples from the transcribed interviews (Lincoln and Guba, 1985). We also carried out member checking (Creswell, 2014). We checked not only all participants of the FGDs but also all co-researchers serving as member checking. In this stage, we returned all the data of the FGDs and our findings to all participants in order to get their feedback and agreement. This step was taken to ensure that our data presentation was without bias. All participants of the FGDs gave consent for us to use the data for our study. school needs for technology integration. Technology integration makes teaching become more teacher centered. Technology integration limits teachers’ role in the classroom. Technology integration limits student centered learning. The integration of technology decreases students’ attention and concentration to the lesson. instruction. P12 noted that many programmes offered by either public or private institutions did not support, not only teachers to extend the use of ICT during teaching and learning processes and the significant advantages using technology compared to traditional teaching styles, but also principals to manage the administration and do supervision in relation to ICT integration in education. The third external barrier found in this study was school culture. Twenty-three participants perceived that the culture of schools could also be a significant barrier for ICT integration in their school. One participant reported that when teachers were told that there would be new ICT devices for instructional activities, they made comments such as, “We purchase ICT devices, then the irresponsible students damage them. It is so annoying that the situation might happen in our school”. In addition to broken devices caused by a few students, some school principals believed that school cultures including the way teachers in the classroom are ingrained, prevent or hinder ICT integration during teaching and learning processes. One of the participants noted, “If the government want to make ICT integration become a success story. It needs to establish school culture that embraces the use of such technologies.” (P15) Half of the participant (15 principals) with thirty-five responses mentioned that the district culture was also a barrier to technology integration in this study. Five participants shared in the discussions that the culture of district became one of the competitive challenges for limited ICT resources in their school. One of the participants, (P6) said that the head of the department in charge for operational stuff in his district was a barrier because he neither supported the ICT integration nor purchased ICT devices for the school in his district. Internal barriers The internal barriers revealed in this qualitative phase our were lack of teachers’ knowledge of ICT and its integration for active learning, lack of teachers’ understanding of ICT and its integration and traditional teaching styles (see Table 4). The first internal barrier identified was lack of teachers’ knowledge of ICT and its integration for active learning perceived by most participants in the FGDs. One participant (P10) reported that the barrier was related to “how proficient the teachers understand technology in general and how good they integrate ICT into their classroom routines.” Another participant (P13) declared that this lack of knowledge of ICT and its integration was “the most important factor predicting the teachers’ decision to use or not to use ICT in their instructional activities.” Lack of teachers’ understanding of ICT and ICT integration was another sub-theme revealed from the qualitative analysis. We identified this sub-theme from twenty-nine participants’ opinions in the FGDs. One of the participants (P7) revealed “Self-efficacy of the teachers is a significant barrier for ICT integration in my school. I have even talked to some of them and they informed me that they lack have lack confidence teaching with ICT.” Another principal (P2) also said that understanding for ICT integration was not the only barrier, but also understanding using the ICT devices as a barrier informed in this study. Twenty-two participants indicated that the traditional teaching style was another barrier to ICT integration in the school they lead. Participants took the view that the uneasy shift from the teacher-centred teaching class to student-centred learning was a barrier. O ne participant (P28) said that teachers, especially senior teachers, have had many years of training and practices to conduct instructional activities in a specific way where students just listen to their lecture with no innovation in the teaching and learning processes. integration. Another study by Wachira and Keengwe (2011) reported that Japanese schools found formidable barriers, specifically the absence of media specialists/ technology technicians similar to this study result. Professional development regarding ICT integration for effective and efficient teaching and learning processes is an essential component to promote the use of ICT during instruction (Derbel, 2017). However, professional development programmes can be, in some circumstances condition, be perceived as one of the significant barriers for ICT integration when the programmes are not in relation to actual teaching practices or merely focused on ICT skill development (Tarman and Chigisheva 2017). This study also revealed similar results, the Indonesian school principals stated that the professional development courses that teachers need to attend were not relevant to their needs for integrating ICT. They perceived insufficient technology-related professional developments as one of the barriers. Briefly, the conclusion can be drawn that the perceived barriers of school principals to ICT integration in instructional activities show similarities across time, space, and culture. From the survey and FGDs, it is revealed that the participants of this study believed that teachers’ lack of knowledge of ICT and its integration, lack of confidence in using ICT integration delete, and beliefs in traditional teaching styles were the external barriers for ICT integration. Teachers’ level of ICT skill and confidence were predicting factors and had a significant influence on the quantity of ICT integration used to support teaching and learning processes (Cui and Vowell, 2013; Alkhawaldeh and Menchaca, 2014 ). One of the significant findings revealed that the lack of necessary knowledge is an unavoidable barrier to ICT integration in education (Mackenzie 2013). In addition to teachers’ lack of knowledge and confidence of ICT and its integration, traditional teaching styles were also revealed as a barrier that could not easily be overcome. This barrier is very complicated and has been rooted in school teaching cultures in relation to teachers’ background, education and experiences, and thus it is difficult to overcome (Tondeur, et al., 2009; Cuban and Jandric, 2015;). Most principals that participated in the FGDs believed that the traditional teaching style was a lasting barrier for many teachers, particularly older teachers. This finding is in alignment with previous studies (Ertmer, et al., 2012; Kim, et al., 2013; Mueller, et al., 2008). This study recommends that district-level educational authorities should provide and develop professional development training programmes for principals and teachers to improve effective ICT plans with an emphasis on ICT integration in schools. This training programme is crucial for principals to comprehend and evaluate the significance of collaborating to establish set specific goals regarding ICT integration, setting an appropriate budget plan for ICT purchases and updating old technological devices, and recognizing supports for teachers, as well as including balanced professional development opportunities. When principals are trained, they will be able to start the process of revision or development, and finalisation of a technology plan with real effectiveness for the school. Principals should be committed to working in collaboration with schools’ staff members to develop a short and long term ICT integration plan. Early steps would be developing the current inventory of technologies, teachers’ needs, and annual objectives for a computer ratio for students. In addition, schools should move towards a programme of one device per student. They should plan to utilize and organize computer labs to support academic activities. This plan should include the proposal of funding sources and the potential funding capacity to purchase new technological devices, renew old and slow devices and support the maintenance of the wireless capacity within their school sites. The district’s technology departmental authorities should be invited to get involved, or at least to have a discussion and consultation when the plan is established and implemented. References Alghamdi, A. and Prestridge, S., 2015. Alignment between principal and teacher beliefs about technology use. Australian Educational Computing, [online] Available at: <http://journal.acce.edu.au/index.php/AEC/article/view/52> [Accessed 3 January 2018]. Alkhawaldeh, N.I. and Menchaca, M., 2014. Barriers to utilizing ICT in education in Jordan. International Journal on ELearning, [online] Available at: <https://www.learntechlib.org/p/39525/> [Accessed 2 January 2018]. Avidov-Ungar, O. and Shamir-Inbal, T., 2017. ICT coordinators’ TPACK-based leadership knowledge in their roles as agents of change. Journal of Information Technology Education: Research, [online] Available at: <https://www.informingscience.org/Publications/3699> [Accessed 5 May 2018]. Bingimlas, K.A., 2009. Barriers to the successful integration of ICT in teaching and learning environments: A review of the literature. Eurasia Journal of Mathematics, Science & Technology Education, [online] Available at: <http://www.iserjournals.com/journals/eurasia/download/10.12973/eurasia.2009.00146a> [Accessed 30 December 2018]. Brannen, J., 2005. Mix-method research: Discussion paper. NCRM research review paper. Chang, I. H., 2012. The effect of principals’ technological leadership on teachers’ technological literacy and teaching effectiveness in Taiwanese elementary schools. Educational Technology & Society, [online] Available at: <https://www.j-ets.net/ETS/journals/15_2/28.pdf> [Accessed 3 January 2018]. Charbonneau-Gowdy, P., 2018. Beyond Stalemate: Seeking Solutions to Challenges in Online and Blended Learning Programs. The Electronic Journal of e-Learning, [online] Available at: <http://www.ejel.org/volume16/issue1> [Accessed 25 August 2018]. Claro, M., Nussbaum, M., López, X. And Díaz, A., 2013. Introducing 1:1 in the classroom: A Large scale experience in Chile. Educational Technology & Society, [online] Available at: <https://www.j-ets.net/ETS/journals/16_3/24.pdf> [Accessed 3 January 2018]. Collins, A. and Halverson, R., 2009. Rethinking education in the age of technology: The digital revolution and schooling in America (technology, education connections—TEC series). New York, NY: Teachers College Press. Creswell, J.W., 2014. Research design: qualitative, quantitative, and mixed methods approaches. Thousand Oaks, CA: Sage. Cuban, and Jandric, P., 2015. The dubious promise of educational technologies: Historical patterns and future challenges. E-Learning and Digital Media, [online] Available at: <https://journals.sagepub.com/doi/10.1177/2042753015579978> [Accessed 10 January 2018]. Cui, G. and Vowell, R., 2013. Leadership issues concerning instructional technology. In S. Wang & T. Hartsell (Eds. ), Technology integration and foundations for effective leadership (pp. 261-277). Hershey, PA: Information Science Reference. Deng, F., Chai, C.S., Tsai, C.C. and Lee, M. H., 2014. 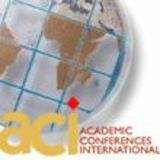 The relationships among Chinese practicing teachers’ epistemic beliefs, pedagogical beliefs and their beliefs about the use of ICT. Journal of Educational Technology & Society, [online] Available at: <https://www.j-ets.net/ETS/issues3221.html?id=63> [Accessed 2 January 2018]. Derbel, F., 2017. Technology-capable teachers transitioning to technology-challenged schools. Electronic Journal of eLearning, [online] Available at: <http://www.ejel.org/issue/download.html?idArticle=598> [Accessed 5 May 2018]. Ertmer, P.A. and Ottenbreit-Leftwich, A.T., 2010. Teacher technology change: How knowledge, confidence, beliefs, and culture intersect. Journal of Research on Technology in Education, [online] Available at: <https://www.tandfonline.com/doi/abs/10.1080/15391523.2010.10782551> [Accessed 3 January 2018]. Ertmer, P.A., 1999. Addressing first-and second-order barriers to change: Strategies for technology integration. Educational Technology Research and Development, [online] Available at: <https://link.springer.com/article/10.1007/BF02299597> [Accessed 21 January 2018]. Ertmer, P.A., Ottenbreit-Leftwich, A. and York, C. S., 2007. Exemplary technologyusing teachers: Perceptions of factors influencing success. Journal of Computing in Teacher Education, [online] Available at: <https://www.tandfonline.com/doi/abs/10.1080/10402454.2006.10784561> [Accessed 2 January 2018]. Ertmer, P.A., Ottenbreit-Leftwich, A. T., Sadik, O., Sendurur, E. and Sendurur, P., 2012. Teacher beliefs and technology integration practices: A critical relationship. Computers & Education, [online] Available at: <https://www.sciencedirect.com/science/article/pii/S0360131512000437?via%3Dihub> [Accessed 2 January 2018]. Fraenkel, J. and Wallen, N., 2009. How to design and evaluate research in education. New York, NY:McGraw-Hill. George, D. and Mallery, P., 2001. SPSS for Windows. Needham Heights: Allyn & Bacon. Gray, L., Thomas, N., and Lewis, L., 2010. Educational technology in U.S. public schools: Fall 2008. [online]. NCES 2010-034. Available at: <http://nces.ed.gov/pubs2010/2010034.pdf> [Accessed 2 January 2018) Habibi, A., Mukminin, A., Riyanto, Y., Prasojo, L.D., Sulistiyo, U., Saudagar, F. and Sofwan, M., 2018. Building an online community: Student teachers’ perceptions on the advantages of using social networking services in a teacher education program. Turkish Online Journal of Distance Education, [online] Available at: <http://tojde.anadolu.edu.tr/yonetim/icerik/makaleler/1599-published.pdf> [Accessed 3 September 2018]. Hargreaves, A., Earl, L., Moore, S. and Manning, S., 2001. Learning to change. Teaching beyond subjects and standards. California: Jossey-Bass. Hermans, R., Tondeur, J., van Braak, J. and Valcke, M. (2008). The impact of primary school teachers’ educational beliefs on the classroom use of computers. Computers & Education, [online] Available at: <https://www.sciencedirect.com/science/article/pii/S0360131508000377> [Accessed 3 January 2018]. Kilinc, E., Tarman, B. and Aydin, H., 2018. Examining Turkish Social Studies Teachers’ Beliefs About Barriers toTechnology Integration. TechTrend. [online] Available at: <https://link.springer.com/article/10.1007%2Fs11528-018-0280-y> [Accessed 29 September 2018]. Kim, C., Kim, M.K., Lee, C., Spector, J.M. and DeMeester, K., 2013. Teacher beliefs and technology integration. Teaching and Teacher Education, [online] Available at: <https://www.sciencedirect.com/science/article/pii/S0742051X1200131X> [Accessed 2 January 2018]. Kimmons, R., Miller, B.G., Amador, J., Desjardins, C.D. and Hall, C., 2015. Technology integration coursework and finding meaning in pre-service teachers’ reflective practice. Educational Technology Research and Development, [online] Available at: <https://link.springer.com/article/10.1007/s11423-015-9394-5> [Accessed 2 January 2018]. Koh, J.H.L., Chai, C.S. and Tsai, C.C., 2013. Examining practicing teachers’ perceptions of technological pedagogical content knowledge (TPACK) pathways: a structural equation modeling approach. Instructional Science, [online] Available at: <https://link.springer.com/article/10.1007/s11251-012-9249-y> [Accessed 3 January 2018]. Korumaz, M., 2016. Invisible barriers: The loneliness of school principals at Turkish elementary schools. South African Journal of Education. [online] Available at: <http://www.sajournalofeducation.co.za/index.php/saje/article/view/1302/659> [Accessed 5 May 2018]. Lawshe, C.H., 1975. A quantitative approach to content validity. Personnel Psychology, [online] Available at <https://onlinelibrary.wiley.com/doi/pdf/10.1111/j.1744-6570.1975.tb01393.x> [Accessed 13 May 2017]. Lim, C.P., Zhao, Y., Tondeur, J., Chai, C.S. and Tsai, C.C., 2013. Bridging the gap: Technology trends and use of technology in schools. Educational Technology & Society, [online] Available at <https://www.j-ets.net/ETS/issues37ab.html?id=59> [Accessed 5 January 2018]. Lincoln, S.Y. and Guba, G.E., 1985. Naturalistic inquiry. New York: SAGE Publications. Luschei, T., 2017. 20 years of TIMSS: Lessons for Indonesia. Indonesian Research Journal in Education |IRJE|, [online] Available at <https://online-journal.unja.ac.id/index.php/irje/article/view/4333> [Accessed 5 May 2018]. Machado, L.J. and Chung, C.J., 2015. Integrating technology: The principals’ role and effect. International Education Studies, [online] Available at: <http://www.iserjournals.com/journals/eurasia/download/10.12973/eurasia.2009.00146a> [Accessed 30 December 2018]. Mackenzie, T. (2013). What are the Barriers to Tech Integration in the Classroom? Retrieved from https://trevmackenzie.wordpress.com/ 2015/10/19/what-are-the-barriers-to-tech-integration-in-theclassroom/ Mishra, P. and Koehler, M.J., 2006. Technological pedagogical content knowledge: A framework for teacher knowledge. Teachers College Record, [online] Available at <https://www.tcrecord.org/content.asp?contentid=12516> [Accessed 3 January 2018]. Mueller, J., Wood, E., Willoughby, T., Ross, C. and Specht, J., 2008. Identifying discriminating variables between teachers who fully integrate computers and teachers with limited integration. Computers & Education, [online] Available at <https://www.sciencedirect.com/science/article/pii/S0360131508000390> [Accessed 3 January 2018]. Nortvig, A.M., Petersen, A.K., and Balle, S.H., 2018. A Literature Review of the Factors Influencing ELearning and Blended Learning in Relation to Learning Outcome, Student Satisfaction and Engagement. The Electronic Journal of e-Learning, [online] Available at <http://www.ejel.org/volume16/issue1> [Accessed 2 January 2018]. Rosen, L. and Michelle, W., 1995. Computer availability, computer experience and technophobia among public school teachers. Computer in Human Behaviour, [online] Available at <https://www.sciencedirect.com/science/article/pii/074756329400018D> [Accessed 2 January 2018]. Ross, S.M., 2010. Introductory statistics. Academic Press. Serhan, D., 2007. School principals' attitudes towards the use of technology: United Arab Emirates technology workshop. The Turkish Online Journal of Educational Technology, [online] Available at <http://www.tojet.net> [Accessed 2 January 2018]. Sofwan, M. and Habibi, A., 2016. Problematika Dunia Pendidikan Islam Abad 21 dan Tantangan Pondok Pesantren di Jambi. Jurnal Kependidikan: Penelitian Inovasi Pembelajaran, [online] Available at: <https://journal.uny.ac.id/index.php/jk/article/view/9942> [Accessed 2 May 2018]. Stake, R.E., 1995. The Art of case study research. Thousand Oaks: Sage. Tarman, B. and Chigisheva, O., 2017. Transformation of educational policy, theory and practice in post-soviet social studies education. Journal of Social Studies Education Research, [online] Available at: <http://dergipark.gov.tr/download/article-file/375107> [Accessed 3 May 2018]. Tondeur, J., Devos, G., Van Houtte, M., van Braak, J. and Valcke, M., 2009. Understanding structural and cultural school characteristics in relation to educational change: The Case of ICT integration. Educational Studies, [online] Available at: <https://www.tandfonline.com/doi/abs/10.1080/03055690902804349> [Accessed 3 January 2018]. Wachira, P. and Keengwe, J., 2011. Technology integration barriers: Urban school mathematics teachers’ perspectives. Journal of Science Education Technology, [online] Available at: <https://link.springer.com/article/10.1007/s10956010-9230-y> [Accessed 3 January 2018].